NATICK - Silversmith and goldsmith John Harwood made his pieces by hand, so every work was unique. “He was one of a kind, just like the work he did,” recalled his wife, Sue Ellen Harwood. John Harwood, who was artist-in-residence at Gallery 55 in Natick Center for much of the past decade, died last month at MetroWest Medical Center in Natick. He was 67 years old. Harwood, whose career included time at Long’s Jewelers, was in the metalworking industry for about half a century. He expertly crafted fine jewelry, sculptures and designs in a wide variety of techniques. A sailor and woodsman, Harwood brought themes from those passions to his artwork. Glancing at the arrangement of tree branches on a walk in the woods might spark an idea for his next piece. Friends and family recalled his intricate replica boats made from silver as well as his pride in working on two pins for former Secretary of State Madeleine Albright, who is a pin aficionado. Harwood, who lived in Natick, enjoyed making pieces with his hands. “You sit down ... and make something. That’s half the fun,” Harwood told the Daily News in 2016. Silversmiths and others would often come to Gallery 55 and just talk with Harwood. Supporters of the gallery and art in general in Natick loved him, recalled gallery owner John Mottern. “John was a very kind person, very soft-spoken and a little bit reserved,” Mottern said. Harwood also helped with Natick Artists Open Studios, which showcases local artists, said Deb Sayre, an organizer of the event. “He was just a gentle soul who helped wherever he could,” Sayre said. Sayre praised his work on the Albright pins. Sayre will miss his gentleness, warmth and smile. Sue Ellen Harwood recalled how her husband would make a deal if customers wanted pieces they could not afford. A memorial celebration will be held at 3 p.m. Jan. 28 at Common Street Spiritual Center, 13 Common St., Natick, with a reception to follow. Donations may be made in his memory to nonprofit educational program Maritime Gloucester, 23 Harbor Loop, Gloucester, MA 01930. John Chamberlain Harwood, age 67, died December 23, 2017 at Metrowest Medical Center – Leonard Morse Hospital. 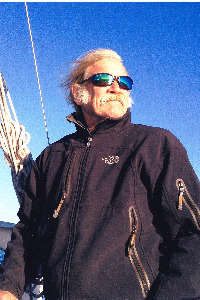 A rugged individualist, John was a great woodsman and sailor. His great love was cruising on the Maine Coast with his wife Sue Ellen and their Scottie dogs. John was a loving husband, everyone’s best friend, favorite uncle and uniquely talented silver and goldsmith. His long career as a craftsman included many years at Longs Jewelers and spanned the gamut of fine jewelry to sculptures to one-of-a-kind designs in a wide variety of techniques. A long-term artist in residence at Gallery 55 in Natick, John was well loved and respected by that community. He was honored by the privilege to custom design 2 handmade brooches for former Secretary of State Madeline Albright’s private collection. He was a member of NAOS (Natick Open Studios), Marblehead Arts Association and Manchester Harbor Boat Club. John harbored a deeply rooted spirituality, true to his own philosophy. His church was a grove of pine trees or a peaceful harbor at sunset. Growing up in the mountains, he became fluent on the ski slopes and at home in the natural world. His love for the sea, cultivated by his relationship with his late father-in-law Stanley “Bud” Collinson, led him to become a calm, adept captain. A kind listener, John’s candid opinions were valued. His family, friends and dedicated loyal customers will miss him. He was a silversmith with a heart of gold. Born in Boston, MA, on October 13, 1950, he was the son of the late Hugh and Betty Bowker Butts Harwood. John is survived by his wife of 31 years, Sue Ellen (Collinson) Harwood of Natick; his brothers Richard Kistler Harwood and his wife Patricia of VA; Peter Bowker Harwood of CA; and his sister Ann Harwood Bowden of Hyannis, MA. Also surviving him are in-laws: Stanley and Daisy Nell Collinson of Essex, MA, Caroline and Joe Madsen of FLA and Jane Collinson of Natick; numerous nieces and nephews and grand nieces and nephews. A Memorial Celebration will be held on Sunday, January 28, 2018 at 3:00 pm at the Common Street Spiritual Center (13 Common Street, Natick, MA). A Reception is to follow. Donations may be made in John’s memory to Maritime Gloucester, a 501C3 non-profit educational program, 23 Harbor Loop, Gloucester, MA 01930. For over 40 years, John Harwood has refined his skill as a craftsman of silver. He prefers the term “craftsman” to that of “jeweler” - even though he is both - because to him a craftsman pursues his passion. Harwood, and his wife Sue Ellen, share studio space at Gallery 55 with photographer John Mottern and his partner Anet James. (55 South Main St., Natick, web: harwoodarts.com and http://www.gallery55.com/). Harwood enthusiastically participates in the Natick Artists Open Studios (NAOS) weekends. NAOS: How did your journey bring you here? John: Close to 10 years ago, I showed John Mottern a few pieces I had roughed out. He showed me a display case here and said, “Put them there.” That was some eight years ago. So I exhibited my work for several years here at Gallery 55, then set up my workshop here about four years ago. NAOS: What makes your work different? John: (smiles) My work has been described as eclectic, and I agree. Everything I do is one of a kind. I don’t follow patterns or make duplicates, whether we’re talking about silver jewelry, or this silver rowboat on my workbench (see photo). NAOS: What appeals to you about this location? John: This is a great space. It doesn’t look like much on the outside, but people walk in and see the high ceilings, the antique wood floor, and of course the art on display, and they say ‘wow.’ We’ve had exhibits of photography, jewelry, and woodworking. I’m excited to be in the middle of it all. NAOS: What draws you to the art scene in Natick? John: The sense of community is huge. I had no idea how many artists there were here until I came into this gallery. Years ago, artists in town were more scattered. People like Deb Sayre and John Mottern were catalysts to bring us together. Their enthusiasm, motivates us, and we have really come together into a true community. We’re all very supportive of each other. You get the sense that members of the art community really have each other’s backs. NAOS: What are your hopes for Open Studios weekend? ​John: Open Studios weekend is the perfect opportunity to meet new people, and for our community at large to learn about the art scene. The weekend is all about outreach and exposure. It’s great that we’re doing it - I’d be happy if we did it more than once a year! Obviously I want my business to succeed. Money is important, but money is the byproduct of what you do. I want the whole art community to thrive, and that’s what this weekend is all about. Each October over the past 14 years, local artists have opened their studios to the world in a celebration of art and community known as Natick Artists Open Studios (NAOS). The event has grown to over 70 artists passionate about from jewelry, ceramics, sculpture, photography, painting, woodworking, to artistry with paper, fabric, glass, or garden. The weekend offers a unique opportunity to visit studios not normally open to the public, and to meet the artists themselves. This year’s Open Studios weekend is Oct. 18-19. The weekend is run entirely by volunteers who love the Natick art community.